Down below the amphitheater, and rarely visited (we had to find a caretaker to open the house for us) is a small, carefully restored Roman home. It is part of a roman residential area that has been under excavation for nearly half a century, revealing streets and shops and houses. The ruins here date from the reign of Hadrian. 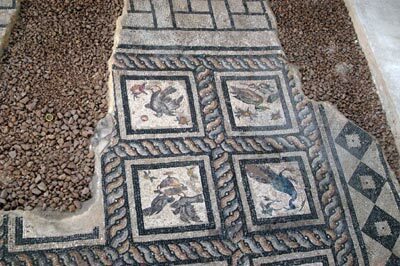 This house is called the Villa of the Birds because of the large mosaic in the middle of the main room, with a dozen birds in brilliant colors. 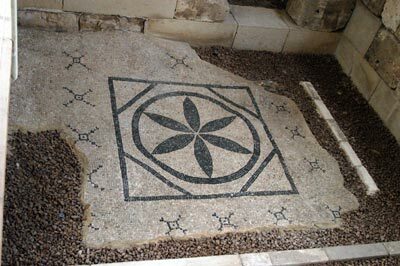 This particular house is a small one, but the floors are covered in delicate mosaics, a different one in every room. 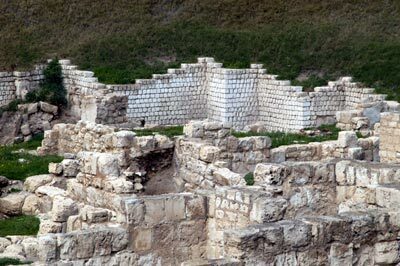 This must have been a richer neighborhood in Roman Alexandria -- the ruins of the rest of the residential area is outside. We're used to seeing mosaics on the wall or protected by red-velvet ropes in a museum -- the idea that people used to walk on these hard 'rugs' is a bit hard to comprehend. The workmanship is fine and delicate, and the restoration work has been very sensitive.